If either a lack of inspiration or a lack of pva paint, glue and glitter prevent you from doing arts and crafts with your little ones, CubbyKit is here for you. All boxed up and with free delivery, the hard work has been done for you, so that you can get straight on with the business of creating fun projects with your child. CubbyKit themes have been carefully selected and our activities are tried and tested. So how does CubbyKit work? Join up at www.cubbykit.com by selecting which age range you’d like. CubbyKits come in two age groups: 3-4 years and 5-6 years. Every month your CubbyKit arrives at your house addressed to your child and contains 3 separate activities with all the materials you need. Everything is measured especially for your kit, saving you time and reducing waste. Our themed picture guides enable you to produce creations you and your child will feel proud of and play with for hours. We include extra crafts bits and bobs and plenty of ideas. Drawing on memories of fun from their own childhoods the creators of CubbyKit have designed Kits with a different theme every month: it might be Outer Space, the Olympics, Kings and Queens or the Great Outdoors. All ideas are inspired by projects children will revisit when they start school. So you’ll be giving them an introduction to those ideas whilst enjoying easy, hands-on fun together. You can be assured that before CubbyKits are sent out, they have been reviewed by advisors and tested by children themselves. Lisa, mum of two and CubbyKit creator says she believes that the educational aspect of CubbyKit is what makes it so exciting. “Each CubbyKit encourages children to immerse themselves in something new which will complement what they learn in school. Whether they are exploring the wonders of Outer Space or playing traditional (but home made) instruments from around the world, they’re using their own imaginations to get there”. 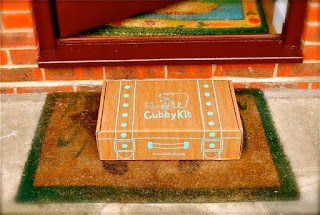 At £19.99 a month or £199 for 12 months (a saving of £39.89 or 2 months free), CubbyKit is great value. To meet the creators of CubbyKit, see inside a sample Kit and to subscribe today, visit www.cubbykit.com or email cubby@cubbykit.com for more information. Above post is sponsored, and I have received a Cubby Kit which I will review at a later date.